Milo Barham arrived in Perth in February 2012 after completing his BSc (hons), PhD and a year of teaching at the National University of Ireland Galway. Milo worked for five years as a lecturer in sedimentology and stratigraphy at the Department of Applied Geology, Curtin University and is now a Curtin researcher on the Capricorn Orogen, analysing detrital mineral associations to track sediment routing and basin evolution and thus better resolve the geological history of the region. 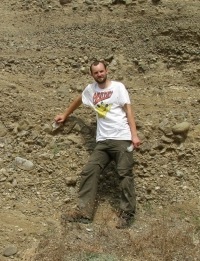 Milo’s past research has focussed on integrating sedimentological, palaeontological and geochemical techniques to elucidate palaeoenvironmental conditions, track basin evolution and contextualise geological and biological events in Earth history. Milo currently sits on the Geological Society of Australia, Western Australia committee and the sub-commission of Western Australian Stratigraphy. 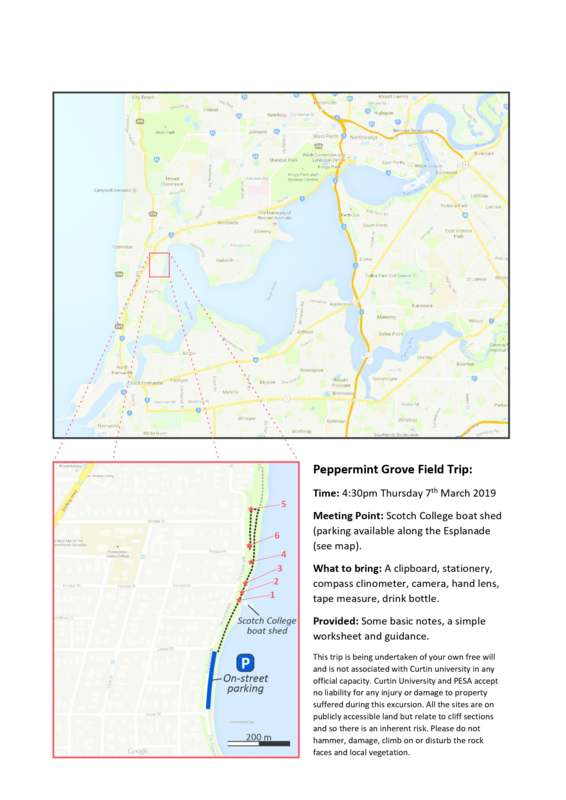 PESA WA invites you to join us for our evening field trip to Peppermint Grove on Thursday 7th March. Dr Milo Barham, an expert in Sedimentology and Stratigraphy (Curtin University) will lead the field trip focusing on exploring the well-exposed, Pleistocene-aged Tamala Limestone outcrops. Afterwards, there will be a short debrief and Q&A session with our trip leader at the Albion Hotel. The Tamala Limestone crops out in a near continuous ribbon for over 1000 km along the southwestern coast of Western Australia. Although dominated by Pleistocene aeolianites, with increasing study and recognition of discrete members, the temporal and environmental complexities of the Tamala Limestone’s deposition are becoming clearer. At Peppermint Grove, several facies are well-exposed in a relatively small area, allowing for easy investigation of classic Western Australian lithofacies, and broader carbonate-dominated sedimentary features from a variety of paralic depositional environments (aeolian to shallow marine). Improved age constraints and investigation of facies-relationships at Peppermint Grove allow for the generation of simple sea-level curves for this section and a broader discussion of Pleistocene glacioeustatic sea-level curves and their influence on sediment packages. Our trip leader will provide some basic notes, a simple worksheet and his expert guidance, therefore attendees are encouraged to bring along the following items: a clipboard, stationary, compass-clinometer, hand lens, tape measure, obligatory item for scale and drink bottle. 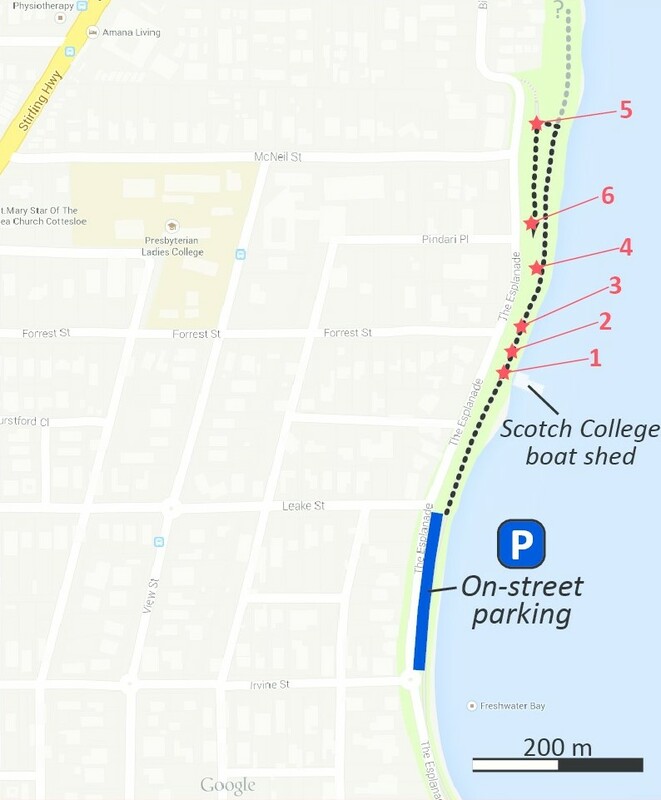 Meeting Point: Scotch College boat shed (parking available along the Esplanade (see map below).